How much Sand Remedy required really does depend upon the condition of your existing soil, and what other soil improvement products you may be using when applying Sand Remedy. Areas of your garden will probably be different in how they absorb or repel water - this is quite normal. Make an assessment and try it out! If you use too much Sand Remedy, simply incorporate it a little deeper into the soil. If you don't think you've used enough in some spots, you may need a repeat application. For very large areas, the most economical way to use Sand Remedy is in individual planting holes where you are going to be planting out. The ideal proportion of Sand Remedy to incorporate into sandy soil is around 3 - 5% total volume. Once this is incorporated into the sand, it bonds with sand particles and stays there, permanently. As part of ANY soil improvement program, we always recommend regularly incorporating quality organic matter (eg. compost or well rotted manure) in order to build a healthy, living soil. Remember - the organic gardener's mantra is "feed the soil, not the plants". 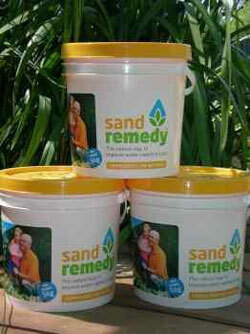 Sand Remedy™ is available in 5kg tubs and 20kg tubs. © Green Life Soil Co.